As I purchased this book online and awaited it’s subsequent delivery, I was already prepared to like it (which is usually the exact opposite of what I expect when I read a new author, because I am pretty picky about how an author writes.) But I know this author. I don’t mean I know her in the way I know Stephen King, having read almost everything he’s ever written. I literally know her. Elly Zupko, author of The War Master’s Daughter, has been a close friend of mine for about 20 years. That she is a talented and creative author with a gifted sense of prose is common knowledge to me. Now, after great effort and determination on the author’s part, the rest of the world can know too. When my copy of the book finally arrived, the first thing that struck me even as I pulled it from the manila envelope, was the attractive cover. The cover of a novel is something that many people take for granted. But for an independently published novel such as this, great care has been taken on the part of the author to design and handpick the image for the cover. The finished product is the author’s “baby,” and it is evident from the pleasingly glossy finish and striking sepia colored image depicted that Zupko has approached the whole novel, right down to the cover, as a labor of love. At first glance, the front of the novel seems to suggest mysteries and symbolism hidden within the pages. And the reader is not disappointed. The War Master’s Daughter, while described as historical fiction, has a deeper purpose than mere entertainment. The plot is of a privileged young noblewoman who finds herself on the wrong side of the border in the midst of a war between two nations. Rife with philosophical metaphors on the nature of man and humanity, Zupko tackles heavy themes with grace. Although at times the characters’ conversations ring more like practiced monologues or axiomatic lectures, given the time period in which the novel is set, this can possibly be attributed to the common speech patterns of the time. While I initially found some of the narrative passages a bit heavy on the verbiage, as if the author is trying to cram too many adjectives into a sentence, this tendency seemed to pass as the characters began having more interpersonal interactions with one another. Zupko also exhibits excellent attention to detail as she paints a picture for the audience. For instance, when a man pulls up a chair to sit by someone, you see not only the chair, but the room it’s in, all in your mind’s eye. Zupko’s dialogue is inspired and insightful as well, drawing the reader further into the story and illustrating the personality traits of the characters in a “show-don’t-tell” manner. But probably what is the most impressive about this debut novel is Zupko’s use of smooth transition between past and present as a technique for controlling the pace and plot development of the story. Though the cast of characters is fairly small, given the isolated nature of the main character’s predicament, and this makes it easier to discern possible plot twists, Zupko still manages to surprise and engage the reader. She manages what could have been a rather standard and boring storybook ending – “and they all lived happily ever after” – in a way that leaves the reader something to ponder. I genuinely didn’t want the story to end. 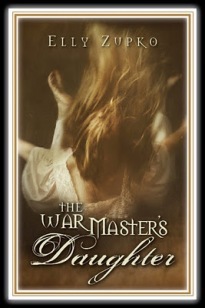 The War Master’s Daughter is likely the beginning of what I hope is a long and prosperous career in fiction for Elly Zupko, and well worth a read. This entry was posted in Entertainment Corner, JustBlog Entries and tagged Author, Elly Zupko, Historical fiction, independent publishing, new fiction, War Master. Bookmark the permalink. You and I felt the same way on many fronts, Kelly! A fantastic review, and I think one that Elly is going to be happy to show the world. Every book has its small faults, but hers is strong on the strengths! I’m hoping you enjoyed it! I certainly enjoyed reading your review!